A new outsize political personality is looming over the future of the North American Free Trade Agreement. Andres Manuel Lopez Obrador — or AMLO for short — was formally chosen last week as the presidential candidate of his Morena political party for Mexico's July 1 election, and instantly became the front-runner based on months of tracking polls. He's described as a nationalist, populist and leftist firebrand, Mexico's counterpart, or counterweight, to Donald Trump. And with the Trump administration appearing to backpedal on its campaign threat to withdraw from NAFTA, it's Lopez Obrador, a two-time presidential runner-up and former mayor of Mexico City, whose campaign could set the tone for trade relations as the renegotiation of the pact moves into overtime. Lopez Obrador, 64, has been attacked by the business community and NAFTA supporters as a "threat to Mexico" because of his nationalist economic policies and his populist motto: "For the good of all, the poor come first." The candidate laid out some of his policy proposals last week after accepting the nomination by the Morena party and two smaller ones. They include selling the presidential airplane and putting the government on an austerity footing, promoting domestic and foreign investment, subsidizing farmers through guaranteed prices, and ending gasoline and diesel imports, which come primarily from the U.S.
Advisers to Lopez Obrador have sought to reassure the financial community that his call for Mexican food self-sufficiency and a review of foreign participation in the energy sector will not lead to protectionism. In fact, Lopez Obrador has toned down his traditional anti-trade and anti-U.S. rhetoric as he tries to ride out his lead of around 10 percentage points in voter surveys. He's even said he'd like to renegotiate NAFTA himself. "You'd think that these two guys coming face to face would naturally be a clash of personalities, but Andres Manuel has resisted the temptation to antagonize Trump," said Duncan Wood, director of the Mexico Institute at the Wilson Center in Washington. Not that analysts or the business community are convinced of his moderate pivot, both in temperament and on policy matters. "I think there's an enormous amount of confusion out there about which is the real AMLO," Wood said. "And I think he is being deliberately ambiguous on a lot of these issues." If Lopez Obrador is the wild card in the election, his two main challengers are seen as safe bets among the business class. 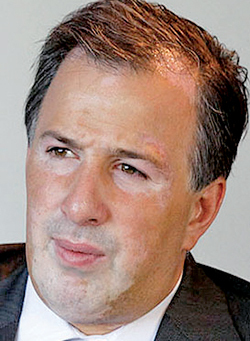 Meade, a native of Mexico City, has spent his career in government service and bills himself as a political independent who is not formally a member of the Institutional Revolutionary Party. He has a doctorate in economics from Yale University and is considered a technocrat. Most recently he was finance minister. Meade is also a former foreign minister who speaks fluent English and sees Mexico as part of a global platform for autos and other industrial goods. 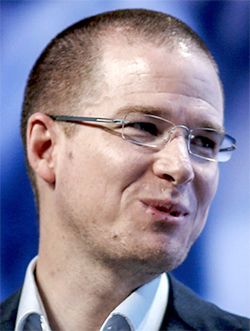 Anaya is a native of Queretaro state in the heart of central Mexico’s fast-growing auto and industrial belt and most recently was president of the pro-business National Action Party and a congressional representative. He has two law degrees and a doctorate in political science from Mexico City’s National University. Anaya presents himself as a tech-savvy, future-focused leader and fan of social media. The platform of his political coalition favors expanding free-trade agreements to include immigration flows and labor rights. 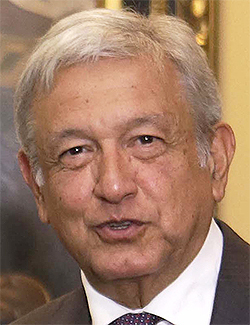 A native of southern Tabasco state, Lopez Obrador has a bachelor’s degree in political science from Mexico City’s National University and began his political career in a local race in 1976. Since then, he has been president of the leftist Party of the Democratic Revolution and was mayor of Mexico City. Now on his third run for president, Lopez Obrador has downplayed his past criticism of NAFTA and economic globalism. He has promised to raise income for poor farmers and wages for industrial workers with a focus on improving the domestic economy. Jose Antonio Meade, the former finance minister for the ruling Institutional Revolutionary Party, supports free trade and foreign investment, as does Ricardo Anaya of the National Action Party. Anaya is running second and has been gaining in the polls in recent weeks, while Meade has been fading. Nomura Securities said in a research note that to win, one of the "pro-market candidates" — Meade or Anaya — would have to capitalize on Lopez Obrador's tendency to commit gaffes as election day nears. "We believe it will be difficult to beat AMLO in this election if he avoids making mistakes," Nomura said. So far, attempts to paint Lopez Obrador as a closet authoritarian along the lines of the late Venezuelan President Hugo Chavez have failed. 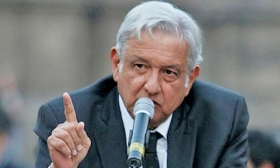 Lopez Obrador said during a campaign stop last week that he wants to meet with top business leaders including billionaire telecom mogul Carlos Slim to reach a broad agreement on policies to move the country forward. "It's becoming increasingly clear that he believes NAFTA has been positive for Mexico, or at the very least that a withdrawal from NAFTA would be incredibly harmful for him and the country," Wood said. The dynamic is similar to that in the U.S. over the past year as NAFTA supporters have become increasingly vocal in response to Trump. "I think that this past year with a new administration in Washington has been the most beneficial year for giving recognition to NAFTA," Mexican Economy Minister Ildefonso Guajardo said this month. "Mexico now has many allies with Republican senators, Republican governors," Guajardo said in a Televisa TV interview. That has bought trade negotiators some time beyond the original March deadline to reach an accord, Guajardo said. A breakthrough could come this summer or even after the U.S. midterm elections in November — which could be just in time for the Dec. 1 inauguration of Mexico's next president. NAFTA supporters have called presidential front-runner Lopez Obrador a "threat to Mexico."